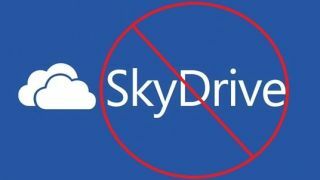 SkyDrive will soon cease to exist. That is, just the name will be gone, but the service will continue to store your files. Following a ruling in the English High Court, Microsoft will be forced to rename SkyDrive, its cloud storage service. The U.K. court deemed "SkyDrive" to be an infringement on British Sky Broadcasting Group's (BSkyB) trademark on the word "Sky." The company has channels called Sky Sports, Sky One and Sky Movies. In June, Microsoft filed for an appeal but decided to agree to the terms set by BSkyB yesterday instead of further ruffling feathers. If not Sky, then what? There's no word on a new name just yet for the software giant, but BSkyB is being rather gracious by letting Microsoft use SkyDrive a little bit longer for at least "a reasonable period of time to allow for an orderly transition to a new brand." Microsoft released a statement to The Verge stating they're happy to be done with the whole fiasco, which is understandable since they had a previous name dispute over "Metro," their old name for the Windows 8 interface, just last year with German company Metro AG. If Windows 8 isn't your cup of tea anyway, try out these Windows 7 tips and tricks.